Do you work for ProMax? Claim your company page now! 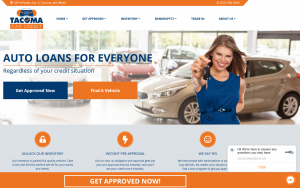 ProMax™ websites are custom designed and integrated completely with a dealer’s ProMax Unlimited system. Inventory is automatically updated and leads are sent directly back into ProMax for effective lead management. Our websites are built using the latest SEO techniques to drive customers to your website and with our responsive mobile design you can be sure you are not missing out on any traffic that comes to your site on a mobile phone or tablet. 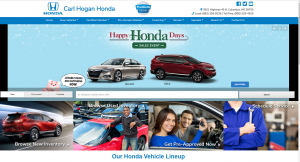 Use it for site for all our dealers. Pros: They created a great web site, one place for all our stores. Easy to navigate and very flexible. Better than the factory one we HAVE to use. Really smooth and very easy to customize. Pros: Easy website to manage, changes are easy and do not require approval. We are very satisfied with the function of our website. Pros: Easy for customers to navigate and look for what they want. Great interactive website, lots of leads. Pros: The overall site is very easy for customers to use, information is very clear and the text tool is great to have. Great interactive website, easy to use. Pros: Please with our website, very customer friendly. Nice layout on the web site. Pros: Very flexible and easy to make changes, they also have great ideas. The support is excellent. Website is managed very well. Flexible. Pros: Can customize it on our own if we want, support is always good if we need help. I like the way it looks and it is easy to navigate. I like the job they do, design and navigation are great. Pros: I like the job they do, design and navigation are great. Pros: Easy for customers to navigate, easy to communicate through this. Cons: It looks messy, the backhand is unorganized and it takes forever to get things fixed or changed. ProMax Websites offer a state of the art back end management system. 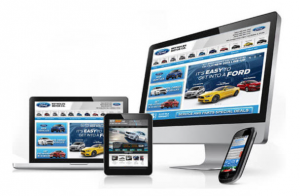 ProMax dealership websites are custom designed and integrated completely with a dealer’s ProMax Unlimited system. This product has not been claimed, so its information can be edited by the DrivingSales community. 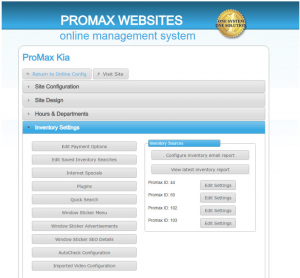 If you work for ProMax, you can claim this vendor or product page.